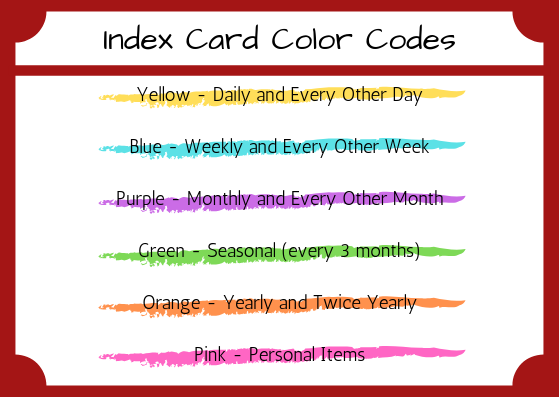 This week we are going to create all the index cards for cleaning the kitchen. Since every kitchen is different, there may be a few things I leave off this list that are relevant to your kitchen. If there are, drop me a comment below and I’ll do my best to add them to the list. 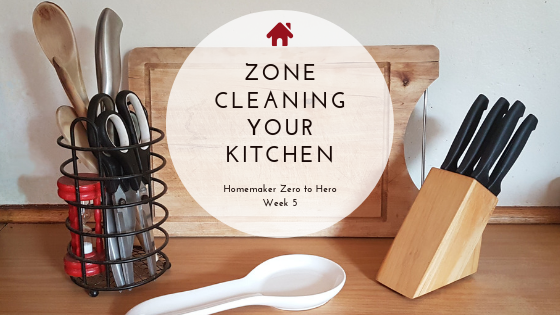 If you have missed the previous weeks, please take a look at the complete list of Homemaker Zero to Hero posts. Please remember that the personal cards are things that you need to be reminded to do, but if another person were to come into your home to clean you wouldn’t give them the personal cards. These are things like “Shower” or “Manicure”. Now here is the long list of cards to create this week, all for cleaning the kitchen. The frequency of cards is just a recommendation. Adjust according to your household. Tidy kitchen counters – This means that you remove anything from the kitchen that doesn’t belong there. Handbags, shoes, coats, toys, groceries, dirty plates, newspapers, mail, magazines etc. Return these items to their rightful homes, toss out or put in the dishwasher/kitchen sink. – Daily Card, Yellow – Possibly make two of these cards to be done midday and evening. Only have the appliances you use every day or every second day on the kitchen counter. Consider having a “drop box” on your kitchen counter for keys and mail. A fruit bowl works quite well for this task and usually looks pretty. Just remember to clear it out regularly! Place pots and pans, cutting boards, pot holders, herbs and spices near the stove. Store plastic containers with the lids on, or put all lids in a drawer close to the containers. In your pantry implement a one-at-a-time rule: Don’t open a new container until the old one is empty or discarded. Store loose packets of food in storage containers or stackable containers. Use one container per category. Store the most used items in easy access, and least used items in the harder to reach places. 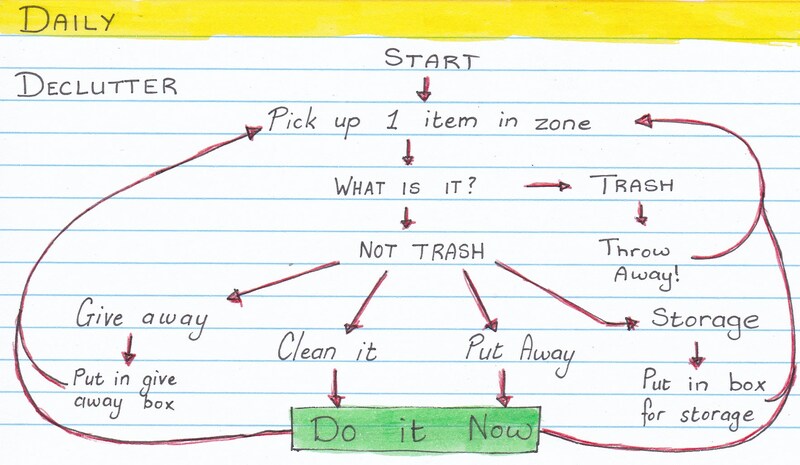 We are going to cover decluttering in detail in a few weeks time, but for now the flow-chart above will give you a great place to start. And that is it from me this week. See you again next week when we will be making the cards for our living rooms. Don’t forget to subscribe so that you will get an email notification when a new blog post is up.